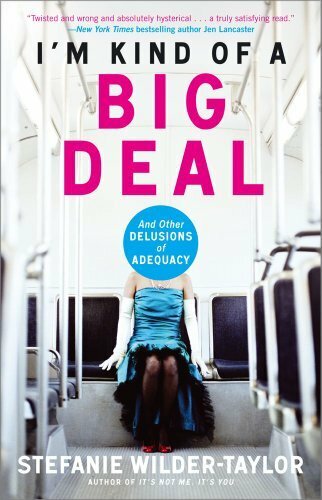 Goodreads: Whether she's driving a limo for former Family Ties star Justine Bateman, dancing in the dark for a rarely seen Bob Dylan music video, or stalking a bachelor reject from TV's Love Connection, Stefanie Wilder-Taylor is kind of a big deal - at least in her own mind. Smart, screwy, and scathingly funny, her tell-all essays capture every cringe-worthy moment of her kind-of famous life. From bombing as a stand-up comic for born-again Christians, to winging it as a singing waitress in an Italian restaurant, to posting open letters to Angelina Jolie and David Hasselhoff, this unstoppable L.A. transplant refuses to give up on her dreams - no matter how ill-advised - and shows us a side of Hollywood better kept hidden. Kritters Thoughts: A snarky collection of stories to create a great memoirish read. Some of the stories were down right hilarious - I may have laughed out loud, but there were a few that fell below the line. A great book to read by the beach or in spurts over the summer. My absolute favorite was the story of her getting a tattoo or at least trying. Her thoughts and reactions would be exactly like mine. I couldn't get a tattoo if you paid me for two reasons: I couldn't make a decision on what I would want or where I would want it, so it's a no go for me. If you are a reader of Jen Lancaster - this would be a great one to add to your collection. For women who love the snarky humor, I would add this to your summer reading list. A quick and short review, but definitely a book to pick up.